For the ultimate culinary faux-paus in Emilia-Romagna, head to a Bolognese Trattoria and without so much as glancing at the menu – assertively ask the waiter for a plate of its famous Spaghetti. In turn you’ll be greeted by a face-palming look of disdain, frantically followed by a long practiced anecdote about how the dish doesn’t exist and never has. It’s a look I’ve been on the receiving end of. With zero local knowledge and my first night in the city I took it initially it as a joke, as if Colonel Sanders was telling me he didn’t do chicken. But the look of frustration on the waiters face revealed the little known truth. 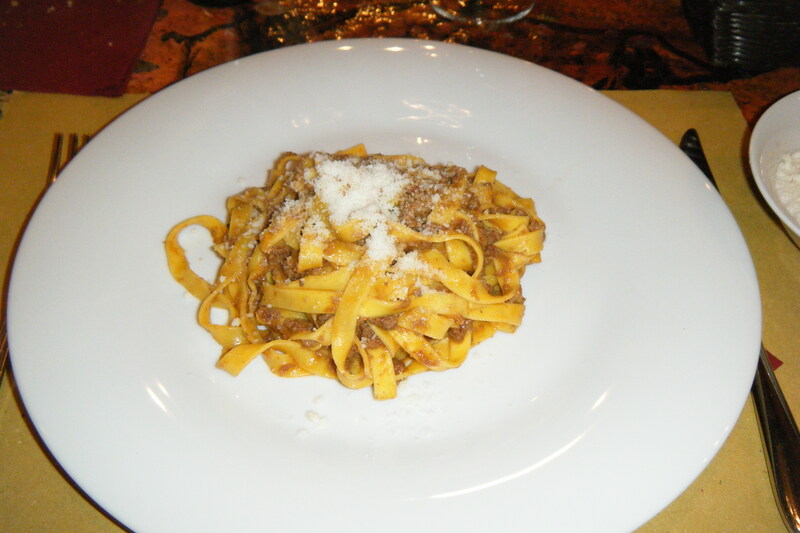 The Bolognese are immensely proud of their culinary traditions and ‘Spaghetti Bolognese’ is in fact one of the greatest imposters of all time, a shabby imitation of one of Bologna’s greatest signature dishes, Tagliatelle al ragù. To be fair the two aren’t exactly miles apart. Both consist of pasta and meat sauce but the difference is in the details. Fresh broad strand Tagliatelle being the pasta component of the true dish while the ragù, a far finer, tastier meat sauce (which takes great skill to make) finishes it off. Perhaps needless to say, the original is vastly superior. With the twenty Regions of Italy – from Trentino to Sicily – all producing vastly different yet tantalizing cuisine, it’s immensely high praise that many Italians consider Emilia Romagna in the north as the place of places to eat. Especially Bologna, a fact reflected in the cities nickname, La Grassa or ‘the fat one’. As well as Tagliatelle al ragù, Bologna is also the home ofLasagna, Tortellini, Tortelloni (giant tortellini) and an outstanding array of local produce. As the rule holds for anywhere in Italy, don’t eat at restaurants. The best eateries – Trattoria’s and Osteria’s – are off the main path, usually snuggly hidden down some unsuspecting alley or away from the city centre. They make local food for local people and thus the standards are very high, with the bonus that the prices rarely are. It’s here that you’ll experience the best of real Italian food, as opposed to a generic plate of penne that you could have gotten anywhere. Here’s the litmus test: if less than 80% of the clientele are speaking Italian, go somewhere else. 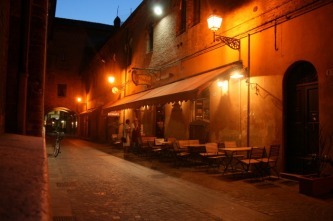 The best value in Bologna has to be Trattoria Trebbi, nestled on the outskirts of the old city centre. It has a warming, old style finish to it and there’s not a dud on the menu. Superb first course choices include the Tagliatelle al ragù (of course), Vecchio verde lasagna (the original green pasta Lasagna), Tricolore gnochetti con pancetta (3 colour miniature gnocchi with bacon in an avacado pureè) andTortelloni con burro e salvia (ricotta and spinach tortelonni with a butter and sage sauce). For a second course expect something a lot heartier with lots of finely roasted meat dishes like coniglio (rabbit), pollo (chicken) and my personal favourite, Cotoletta alla Bolognese (A type of crumbed schnitzel strip wrapped in prosciutto and smothered in melted mozzarella.) Deserts are inexplicably not on the menu, an oddity given that they are available – and delicious – upon request. Get the Torta di Pera e Cioccolato. As good anything sounds, trust me, it tastes even better. However, if you are in the mood for Gelato there’s simply no better place in all of Emilia Romagna than the nearby La Sorbetteria Castiglione. Esteemed throughout Bologna, not only are the flavors amazingly diverse and arguably the tastiest ever (try the Emma: Fig, honey and lemon), but they are also done without gluten, GM, milk, and increasingly, sugar. Near to Bologna the other two unmissable towns are Parma and Ferrara. Parma hardly needs an introduction for culinary excellence when it already lends it name to the legendry Prosciutto and cheese, and Trattoria del Tribunale will ensure your experience with these famous components is of the highest quality. Expect to find Reggiano Parmigiano on just about anything you order here. Ferrara, while less well known than either Bologna or Parma is no light weight. It’s here that I ate the greatest pasta of my life at the towns famous Osteria, Al Brindisi. Its famous for two reasons. Firstly for being the oldest Osteria in the world. Documents confirm it already had the Renaissance equivalent to a Michelin star in 1435 – though its unknown founding date is speculated to go back much further. But secondly and more importantly is the outstanding quality of food. For €7 I got the towns signature dish, Cappellacci al Zucca (Oppulent Raviolli stuffed with herb infused, sweetened Pumpkin) drizzled in the regions famous butter and sage sauce. I really can’t express how mesmerizingly good it tasted, but then I’m forced to that conclusion with nearly everything in Emila Romagna. Until you’ve eaten here, you really can’t say you’ve eaten Italian.